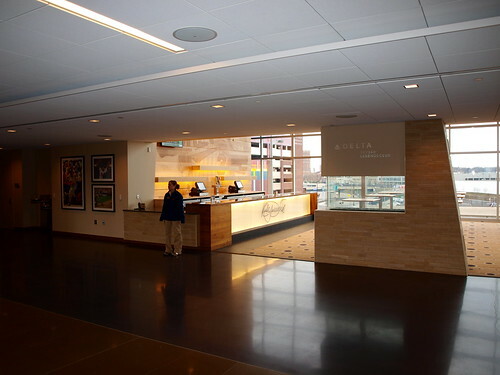 Delta, which acquired Minneapolis-based Northwest Airlines in 2008 and through the subsidiary has been a Minnesota Twins sponsor since 1991, will continue its partnership in the team's new stadium, Target Field. As part of the multi-year partnership officially announced today, Delta will become the team's official airline and sponsor the Delta SKY360 Legends Club, a club-level space where the airline will offer fans an opportunity to sample Delta customer experience. The experience will include a Concierge Desk staffed by many of Delta's frontline employees. The agents, outfitted in Delta's signature "red coats", will partner with a Twins Guest Service Representative at approximately 40 home games throughout the season to answer questions and cater to other customer service needs. "As the Official Airline of the Twins, this new ballpark offers us a unique opportunity to take our relationship with the team and its loyal fans to a new level," said Bill Lentsch, Delta's senior vice president – Minnesota Operations. "We are excited to bring the distinctive Delta brand and experience to life for baseball fans visiting the new Delta SKY360 Legends Club. This latest commitment to the Twins, an organization that is an integral part of Minneapolis/St. Paul, is yet another way we're reinforcing our commitment to the community." In 2009, Delta was presenting sponsor for the team's season-long farewell to the Metrodome. "Our longstanding relationship with Northwest Airlines is one we are very proud of," said Dave St. Peter, president of the Minnesota Twins. "As we move into our new home at Target Field, we welcome our friends and partners at Delta Air Lines to their new home in Minneapolis/St. Paul, and look forward to many more years of success as the home teams." Delta is the largest carrier at Minneapolis-St. Paul International Airport offering more than 400 peak-day departures to 139 nonstop destinations. The Atlanta-based airline, which has recently made a heavy marketing push into New York, also sponsors the Mets, Yankees, Rays, Dodgers, Red Sox, Rockies, Braves, Tigers and Reds. In addition, last Fall the Delta became MSG's first signature partner and also sponsors the NFL's Minnesota Vikings and Seattle Seahawks. One of Delta's longest running sports sponsorships is its 22 year affiliation with the PGA Tour .